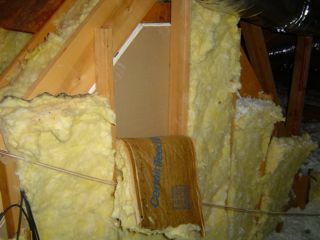 One little, tiny bit of uninsulated area in your attic can result in a mind-blowing reduction in your average R-value. If you’ve got R-30 over 99% of your attic and have only 1%, which could be the attic hatch, at R-1, your average R-value drops to R-23. If you have R-38 over 99% of the attic and R-1 for that last 1%, your average R-value is a mere R-27. The same applies to other uninsulated parts of your home. Ah, attic kneewalls. They’re often one of the weakest parts of a home’s building enclosure. The insulation is falling out. Holes go right through to the attic. The doors aren’t sealed. Even with a comfortable air temperature in the room with attic kneewalls, you may be uncomfortable because the walls themselves get so darned cold in winter.